Commonplacing | gright or gwrong? Here you will find my commonplacing on various texts and works. I firmly believe in physical health, and keeping in shape is one way I manage to keep motivation in my life. Between running and weight lifting, I manage to see small improvements that snowball into great transformations, something I could not live without. These activities constantly remind me of the true strength of the human body, and as a result, I find this quote by Socrates on the subject quite intriguing. I like his choice of diction to associate the human body’s capabilities with “beauty and strength.” These are powerful words for an incredible entity. Source: Socrates. “Socrates -> Quotes -> Quotable Quotes.” goodreads.com. n.d. Good Reads Inc. Web. 4 September 2013. As a person searching for his own dream in tangible form, this statement is magical and inspiring. I need to suppress my tendency to help other people with their programming or gaming concerns and focus more on my own dreams of developing my own entrepreneurial career. Surely my generosity is appreciated, but I am giving more than I am creating myself. Markus Persson did not create Minecraft for his friend or his cousin; he created it for the enjoyment and financial advantage. Perhaps I need a more aggressive approach to life. 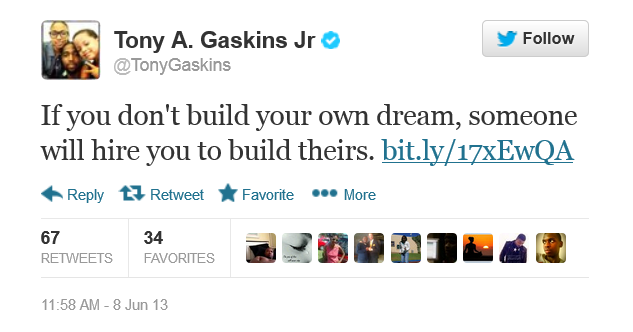 Source (Image and Quote): Gaskins Jr, Tony (@TonyGaskins). “If you don’t build your dream, someone will hire you to help build theirs.” 29 August 2012, 9:08 AM. Tweet. I greatly respect the expertise of Neil deGrasse Tyson, and I really take his advice to heart. I personally enjoy a challenging environment, and that is exactly what I experienced at college. The most rewarding moment is when I put in a significant amount of effort into a very difficult concept, and emerge with a complete understanding of the subject. I sometimes forget this feeling of achievement when I am caught up in easier tasks which seem to numb my mind to true achievement. If more people could feel this phenomenon, the world as a whole would achieve even more. Source (Quote): neiltyson [Neil deGRasse Tyson]. “Re: ‘I’m a teenager who is a big fan…'” Reddit. reddit inc., 4 August 2013. Web. 4 September 2013. I started reading A Brief History of Time because I heard so much about it, and this quote made me realize how much of our lives as humans has been spent trying to figure out where we came from. I think anybody could relate to this idea of a natural curiosity that all humans share. Some answer the mystery of our origin with metaphysics, others physics. So much time and effort has gone into spreading the word and researching new sciences, respectively. Stephen Hawking reminds me of the true scope of our existence, making everything else seem pitiful in comparison. Source: Hawking, Stephen. A Brief History of Time. New York: Bantam Dell Publishing Group, 1996. Electronic. Why talk about what we want? That is childish. Absurd. Of course, you are interested in what you want. You are eternally interested in it. But no one else is. The rest of us are just like you: we are interested in what we want. In an effort to improve my communication to others on my way to fame, I read some of Dale Carnegie’s works. This quote effectively shows the inherent selfishness that we human beings possess. Although I am not too awkward of a fellow, I always jump at the opportunity of improving my communication skills, and I believe that this is a very important skill to master. We communicate very often on a daily basis, and investing just a little time into the skill of communicating is very valuable. If there is one thing I have learned in my schooling, it is that some people inherently have trouble with certain subjects. If you sit me down with a history textbook and tell me I have a test on chapter 1 in an hour, I would almost certainly fall asleep. Once I realized my weaknesses, I was better able to hone my skills on my strengths like computer science. Some people live like the fish in the quote; they get discouraged because they compare themselves to others in their weakest area. Instead, they should focus on their strengths. Source: Albert Einstein (Misattributed). “Albert Einstein -> Quotes -> Quotable Quote.” goodreads.com. Good Reads Inc. n.d. Web. 5 September 2013. Image Source: “Sungei Buloh Wetland Reserve.” Ntu.edu. Nanyang Technological University. n.d. Web. 10 September 2013. I find it intriguing that, although we are the “top animal,” we have an arguably dire weakness: the fear of death. The book that this quote comes from, White Noise, heavily focuses on the fear of death and humans’ attempts to suppress this fear with the drug “Dylar.” I believe there is an element of uncertainty towards life in every person. Some people resort to a life of risk taking, others complete serenity. In a stressful situation, this quote reminds me that everybody else is freaking out like me, except some mask their fears better than others. I would normally disagree with cynicism, but I remembered this quote after my read through of How to Win Friends and Influence People and find that it is more accurate than I first considered. This is a result of associating with a certain group of friends who speak as though each one is in a competition to be the funniest, no matter the vulgarity. This scenario reminds me of this quote on a daily basis. I feel that keeping this mechanic in mind helps to tolerate others more effectively and tailor to others’ interests. -Toad from the video game Super Mario Bros. I grew up with many video games, and one was Super Mario Bros. When Mario reached most of the castles where he was supposedly supposed to rescue the princess, he instead met Toad who told Mario that all his work had gone to waste and that the princess was not there. This quote spurs not only nostalgia but also a determination that is undeterred by a lack of results. Although a bit idiosyncratic, this quote reminds me of my earlier days as a problem solver. 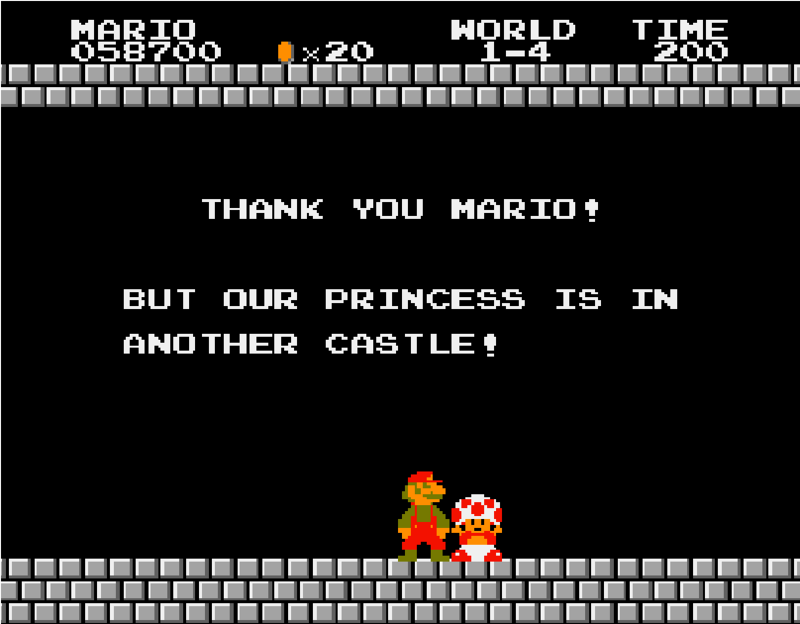 Source (Quote and Image): Created by “Cyber6x.” “But Our Princess is in Another Castle!” knowyourmeme.com. Cheezburger Network, 19 December 2010. Web. 5 September 2013. This quote essentially reminds me of my stupidity when I choose to complain or expect a result when I have not even approached a problem first. This quote is less applicable due to its use of imprecise words such as “pessimist” and “optimist” (nobody is completely a pessimist or an optimist), but it does exemplify my tendency to jump into work without a worry of failure. I carry an internal locus of control, so I would prefer to solve a problem myself rather than rely on an external force to solve it. Source: William Arthur Ward. “William Arthur Ward Quotes” BrainyQuote.com. Tend Glam Media. n.d. Web. 5 September 2013. I haven’t written [my favorite song] yet. That’s what gets me up in the morning. I’m still trying. Hans Zimmer is one of my favorite musicians. I find his orchestral pieces quite engrossing. He was also the composer who made the soundtrack for the movie Inception. This quote from Zimmer is almost as inspiring as his high quality musical compositions. This also poses him as just another human being who needs inspiration just like I do to keep achieving goals. Overall I found this very motivating and a great example of a useful life philosophy. Source: Zimmer, Hans. “Hans is ready to take your questions! Please ask them in the comments below.” Facebook.com. Facebook inc. Web. 7 September 2013.